Consumer groups are reacting with alarm to President Trump's pledge to tear down consumer protections built into the Dodd-Frank Act, passed in 2010 to prevent a re-enactment of the financial meltdown of 2008 and to head off rules that try to rein in stock brokers and investment advisors. 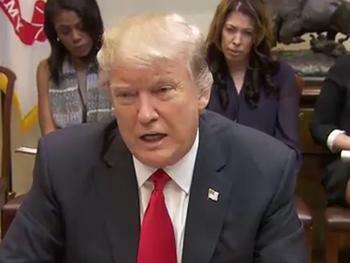 Trump said earlier this week at a meeting with small business leaders that he would do a "big number" on Dodd-Frank, and today he repeated that pledge in a meeting with Wall Street and big business leaders at the White House. Trump told the executives that friends of his were unable to borrow money to support their business plans and, therefore, banking regulations in Dodd-Frank should be relaxed. The regulations are intended to ensure that banks have enough capital to withstand losses in their loan portfolios. Critics of Dodd-Frank contend that it has hampered economic growth and harmed smaller banks. “While the purported intent of supporters was to prevent another economic crisis, Dodd-Frank has centralized banking power into fewer big banks, crushing small town banks across the country. It has also made ‘too big to fail’ the law, rather than eliminating risks to taxpayers," said FreedomWorks CEO Adam Brandon. "It placed restrictions and regulations on small, community banks. These are the banks that lend startup money to nearby entrepreneurs," Brandon said. "Dodd-Frank’s effects have hurt rural economies across the country. Trump is also taking aim at another Obama era regulation, a Labor Department rule that requires stock brokers and other investment advisors to act in the best interests of their client rather than simply trying to sell them whatever financial product is the most profitable. "President Trump continues his streak of throwing middle class Americans under the bus – the very people he promised to protect on the campaign trail," the Consumer Federation of America (CFA) and other groups said in a joint statement. "Today he plans to issue an executive order that threatens to strip working families and retirees of protections they desperately need when they turn to financial advisors for help with their retirement savings." The groups said that rolling back conflict of interest protections for retirement savings will "take tens of billions of dollars a year out of the pockets of hard-working Americans in order to enrich powerful Wall Street interests." The Labor Department rule has not yet gone into effect but is already benefiting consumers, the groups said. "With implementation of the conflict rule just months away, it is already delivering real benefits to retirement savers: costs are dropping for retirement advice and products; incentives to act against customers’ best interest are being eliminated; and investor choice of how to pay for advice has been preserved," according to the CFA, Americans for Financial Reform and American Federation of State, County and Municipal Employees (AFSCME), and Better Markets. "All that will be put in jeopardy so that President Trump can cater to the powerful special interest groups that profit so richly under the status quo," the groups said. Will the EPA continue clamping down on asbestos under Trump?